Leprosy is a chronic infection of the skin, peripheral nerves, eyes and mucosa of the upper respiratory tract, affecting over a quarter million people worldwide. Its symptoms can be gruesome and devastating, as the bacteria reduce sensitivity in the body, resulting in skin lesions, nerve damage and disabilities. Until recently, leprosy was attributed to a single bacterium, Mycobacterium leprae; the medical community now suspect that its close relative, Mycobacterium lepromatosis, might cause a rare but severe form of leprosy. Researchers at the École Polytechnique Federale de Lausanne (EPFL) have analyzed for the first time the complete genome of M. lepromatosis, and compared it to that of the major leprosy-causing bacterium. Published in PNAS, the study reveals the origin and evolutionary history of both bacteria, and offers new insights into their biology, global distribution, and possibly treatment. Along with its mutilating symptoms, leprosy also carries a stigma, turning patients into social outcasts. Although the global medical community have been able to push back the disease with antibiotics, leprosy remains endemic in many developing countries today. Leprosy can manifest itself in various forms, all thought to be caused by the bacterium M. leprae. But in 2008, a study showed considerable evidence that another species of bacterium, M. lepromatosis, causes a distinct and aggressive form of the disease called ‘diffuse lepromatous leprosy’, found in Mexico and the Caribbean. In the current study the team carried out a genome-wide investigation on M. lepromatosis. This complex and computer-heavy technique looks at the bacterium’s entire DNA, locating its genes along the sequence. Because M. lepromatosis cannot be grown in the lab and animal models for this version of leprosy do not exist yet, the scientists used an infected skin sample from a patient in Mexico to obtain the bacterium’s genetic material. After extracting the DNA from the entire sample, the researchers had to separate the bacterial DNA from the patient’s. To do this, they used two genetic techniques, one that increased the bacterium’s DNA and another that decreased the human DNA. With the bacterium’s DNA isolated, the researchers were able to sequence it and read it. Once they had the complete sequence of the bacterium’s genome, they were able to compare it with the known genome of M. leprae, the bacterium responsible for the majority of leprosy cases. 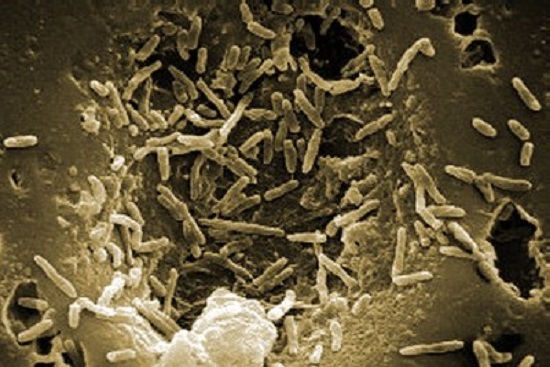 The study found that the two species of bacteria are very closely related. The comparative genomics analysis could ‘backtrack’ the history of their genes, and showed that the two bacteria have diverged 13.9 million years ago from a common ancestor with a similar genome structure, and possibly a similar lifestyle. That ancestor suffered a process known as ‘gene decay’, where over a long period of time and multiple generations, a large number of genes mutated, became non-functional, and eventually disappeared. The study showed that the two new species continued to lose genes but from different regions of their genomes, indicating that during their evolution they occupied different biological roles and mechanisms to ensure survival. The team also conducted a study on over two hundred skin samples from leprosy patients in Asia, Africa, and the Americas to determine the geographic distribution of M. lepromatosis. The results showed that the bacterium is relatively scarce, and seems to be restricted to patients in Mexico. In contrast, the major leprosy-causing bacterium M. leprae is widespread across the world. The current study also discovered that M. lepromatosis has retained the genes needed to infect cells of the nervous system called Schwann cells. These produce protective sheaths that wrap around the axons of peripheral neurons. Although Schwann cell infection is a hallmark of M. leprae leprosy, the presence of related genes in M. lepromatosis means that this bacterium could also be attacking these cells. This will become clearer in future investigations, facilitated in part by the resources generated by this work. The team surmise that this genome-wide comparative study offers new and deeper insights into the biology of M. lepromatosis. By uncovering the evolutionary history of the two leprosy bacteria, it can open up new ways for developing therapeutic strategies. The problem still existing whether either of the bacteria causing the disease,which is the finding a good hosting animal model suitable for investigation of molecular biology and immunology ,both for the bacteria and the disease.